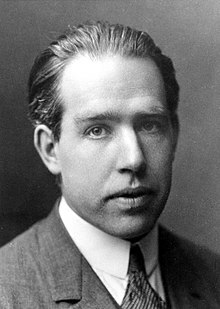 Niels Henrik David Bohr (7 October, 1885 – 18 November, 1962) wis a Dens pheesicist that made essential contreibutions til the unnerstaundin o atomic structur an quantum mechanics. Bohr's model o atomic structur. The electron's orbital angular momentum is quantifee'd; L=nħ. The theory that electrons traivels in discrete orbits aboot the atom's kirnel, wi the chemical properties o the element bein maistlins determined bi the nummer o electrons in the ooter orbits. The consait that an electron coud drap frae a heicher-energy orbit til a laicher ane, emeetin a photon (licht quantum) o discrete energy (this becam the foonds o quantum theory). The Copenhagen interpretation o quantum mechanics. He gat the Nobel Prize for Pheesics for this wark in 1922. Wikimedia Commons haes media relatit tae Niels Bohr. This page wis last eeditit on 30 Mairch 2017, at 22:17.